PORTLAND (June 11, 2010) – adidas, official sponsor of the 2010 FIFA World Cup™, is teaming up with sports superstars Reggie Bush of the New Orleans Saints, Dwight Howard of the Orlando Magic, Dale Earnhardt, Jr. of NASCAR and BJ Upton of the Tampa Bay Rays to excite and engage sports fans across the U.S. for the World Cup. adidas and the athletes will create World Cup videos, quizzes, tweets and more in order to bring American sports fans closer to the tournament. In addition to the pre-kickoff material, Bush will travel to South Africa to witness the 2010 FIFA World Cup first-hand. From the moment he lands in South Africa, he will relay his unique look at the 2010 FIFA World Cups through texts, photos and videos via www.facebook.com/adidasSoccer. 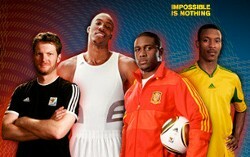 Leading up to the 2010 FIFA World Cup, adidas will post exclusive video content featuring Bush, Earnhardt, Jr. and Upton as they prepare for the tournament. The athletes will show off their own soccer skills, offer their support for the U.S. National Team and preview some of the content that will be featured on Facebook. Fans will get the chance to test their sports knowledge against Bush, Howard, Earnhardt, Jr. and Upton through an interactive quiz on Facebook. The quiz will feature sport crossover-related questions to the four athletes and lets users guess if the athletes will answer them correctly. Bush will not only attend World Cup matches and provide commentary on the tournament, but he will take part in local community tours of service, teach South Africans about American football and even go on a safari. From the moment he touches down in South Africa, Reggie will provide photos, videos, text messages and Tweets via Facebook. Howard, Earnhardt, Jr. and Upton will cheer on the US team, provide commentary on the matches and pick their favorite plays and post exclusive videos and photos to Facebook. Bush, Howard, Earnhardt, Jr. and Upton will compete against each other during the tournament by seeing who can get more fans to support the U.S. National Team in South Africa. The athletes will send video invitations to their fans on Facebook asking them to “Like” the “Go US” Facebook page on their behalf and when fans link through the athletes earns points. Fans will also be able to leave messages of support for the U.S. players.